City Center Mankato has everything you need for success! Unique and flexible meeting venues have the capacity to host events of 5 to 6,500 people. With highly skilled event management teams, state-of-the-art facilities, diverse lodging, accessibility and affordability, the City Center excels as a host location. Extensive trails, outdoor adventures, sports and cultural encounters create a one-of-a-kind memorable experience for your attendees. The City Center Campus is anchored by the Mankato Civic Center, one of the Midwest’s premier sites for meetings and conventions of any size. The Mankato Civic Center features up to 17 meeting rooms that include an elegant Banquet Hall, historic Reception Hall, and Grand Hall. The Mankato Civic Center can provide the space your company needs, with over 75,000 square feet of flexible meeting and event space. Two hotels are connected via skyway to the Mankato Civic Center: Hilton Garden Inn and City Center Hotel. They offer additional meeting spaces as well as 268 total sleeping rooms. 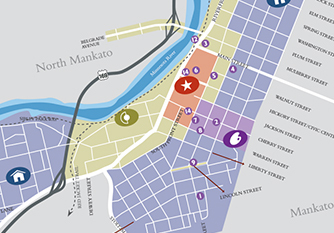 The City Center Campus is conveniently located in the heart of City Center Mankato, with easy access to restaurants, entertainment and shopping.